After a very wet week it looked as if setting up for the project was going to hit a serious wall. Every year we have to bring the wardens luxury accommodation (three caravans! ), all the necessary fencing equipment & signs across 'Webb's field' NPWS nature reserve, to the camp site located just beside the main Little Tern colony (aka 'K-colony'). For the past two years this has been relatively easy to do due to dry conditions but the tracks across the reserve were flooded during the week & by Thursday it seemed as if they were still too muddy to drive across let alone drag a caravan with us! 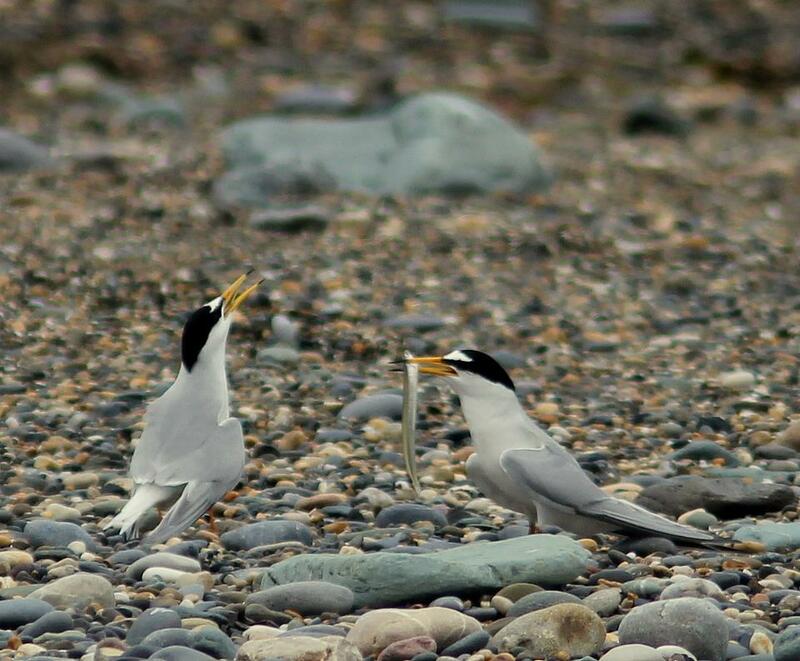 Thankfully the tracks had dried out sufficiently enough for us to bring all the caravans & equipment across yesterday afternoon, so as of this weekend the 2012 Kilcoole Little Tern Conservation Project is good to go! First job on the list is to put the perimeter fence & information signs up around the K-colony indicating which sections of the beach & coastal path are safe for the public to use. 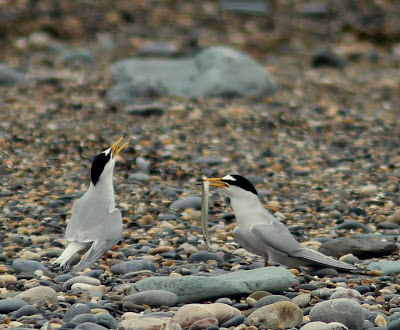 The numbers of Little Terns present has increased dramatically since my last blog post. There are now 70+ birds present at the K-colony, most of which are already going through the motions of courtship. Superb aerial displays, males presenting Sandeels to females & even some apparent nest-site selection have all been observed in the past two days. Once we have an idea of where the terns seem to be settling down to breed then we'll make a start on putting up the protective flexi & electric fencing. Before moving the caravans across Webb's field, I censused the area for breeding Lawping in order to mark out a safe route for us to cross. To my surprise there were even more breeding pairs than I had ever anticipated! Up to 17 pairs are present, consisting of 10 pairs with chicks, 4 pairs sitting on nests & another 3 pairs which seem as if they are holding territory. A fantastic result for them so far & the large number of chicks present indicates there hasn't been any major Fox activity in the area lately. We'll be sure to keep a close eye on their numbers over the season. One brood of four chicks were sighted near the track whilst we were driving across the field so I took the opportunity to ring them. There are still some nice numbers of migrant waders present with peaks counts over the past few days as follows: 145 Dunlin, 53 Whimbrel, 47 Oystercatchers, 33 Ringed Plover, 7 Sanderling, 6 Turnstone, 6 Bar-tailed Godwits, 3 Black-tailed Godwits, 1 Curlew, 1 Redshank & 1 Common Sandpiper. 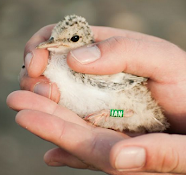 Of particular interest were a couple of 'arctica'-type Dunlin & 'tundrae'-type Ringed Plover which are on their way to breeding grounds well to the North as their names suggest! Other sightings of note in the area: 16 Light-bellied Brent Geese, 5 Gadwall, 3 Wigeon, 3 Shoveler, 7 Teal, 13 Shelduck (including a prospecting pair), a Peregrine, 5 Little Egrets, a male White Wagtail, 6 Wheatears, 5 Sedge Warblers, small numbers of House Martins, Sand Martins & Swifts, good numbers of Swallows (200-300 North per. hour on Thurs), 3 Stock Doves, a singing Yellowhammer & a nice pair of Stonechats at the BirdWatch Ireland reserve. Good luck lads. I hope the season goes really well. Keep the photos coming they're great.